The long weekend is over, trying to get caught up with “stuff” back in the office today. So let me give you a quick report of where I have been, what I have been doing and what I have been catching; will try to go into more detail later in the week. A little over a week ago I mentioned that we were entering one of the best periods of the year to go fishing, https://barbsandbacklashes.wordpress.com/2010/05/21/go-fish-now-may-2010/ . Well how about it? Since last Wednesday I have fished at least a little bit 5 of the last 6 days. I did not fish all day on any one of those days, but spent at least a few hours fishing on every one of those days. I made the statement that we were entering a period of time where the fishing would be good for a variety of species. In the past 6 days my partners and I have caught bluegill, redear sunfish, rock bass, largemouth bass, smallmouth bass, walleye, flathead catfish, white crappie, black crappie and northern pike. How’s that for variety? I continue to “beat the drum” about Nebraska being “The mixed bag capitol of the world” and 10 fish species in 5 days qualifies! I am sure we could have caught more species if we had fished a few more different bodies of water. I have always loved the Interstate 80 lakes in central Nebraska. I grew up in North Platte, and at that time we never had a boat larger than a square-stern canoe. 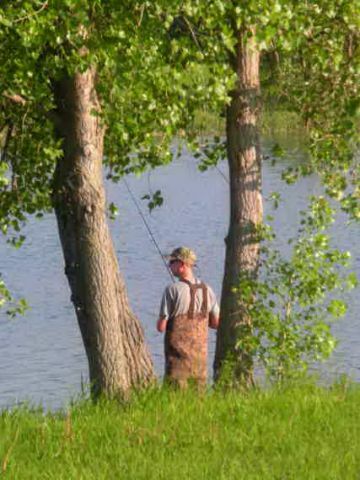 We spent a lot of time fishing interstate lakes. Those waters are other waters where I just get the feeling that I am “back home” whenever I get the chance to spend some time fishing them. Maybe later in the week I will expand on some of my interstate lake/pit fishing strategies, but here I will concentrate on a quick report and showing off some pictures. I expected we would have some good bass fishing on the interstate lakes. We did catch some bass, caught a bunch one night, but we saw a number of bass that were still spawning. In fact there were a couple of really nice largemouths we spotted one night, would have loved to catch the biggest and my son and I spent quite a bit of time trying to get them to bite. But they were so busy defending their spawning territory that we could never get them to pay more than a second of attention to our presentations. It was fascinating to watch them chase and nip at bluegills and they even did that once or twice to our baits, but they never would take them. Eventually we decided we would be better off to locate some fish that were more catchable. The same evening I saw a smallmouth bass in another spot that was guarding a spawn bed, and on another day I watched a couple of other largemouths on a relatively deep bed (approximately 8 feet). I did fool around with those last bass that I saw on a bed and I eventually got one to inhale a bait, but then it came unhooked. We found bluegills were just beginning to spawn. The male bluegills can be so zoned-in on defending their spawning territories that sometimes they do not notice your baits either. But usually if you can keep a bait on them long enough they will eat it. So we managed to catch a bunch of nice bluegills, fish up to 9 inches or so and scratched some bonus redear sunfish along with them. My son Daniel with the biggest redear we caught--a little under 11 inches! That brings to mind another blog post for another time. We find the bluegills and redears together in some locations, but have found that the redears are just a little bit different “animal”. You absolutely will catch some redears right along with the bluegills, but if you really want to catch the redears you need to change up your presentation just a little bit. We spent some time on a couple of other interstate lakes pursuing rock bass. On one of those lakes the rock bass seemed to be in a pre-spawn “mode” and were cruising around looking for something to eat (the females looked like they were ready to burst”, while on the other lake the rock bass were definitely in the middle of the spawn. Again those fish that are actively spawning can be a challenge to catch, but with some coaxing they can be caught. 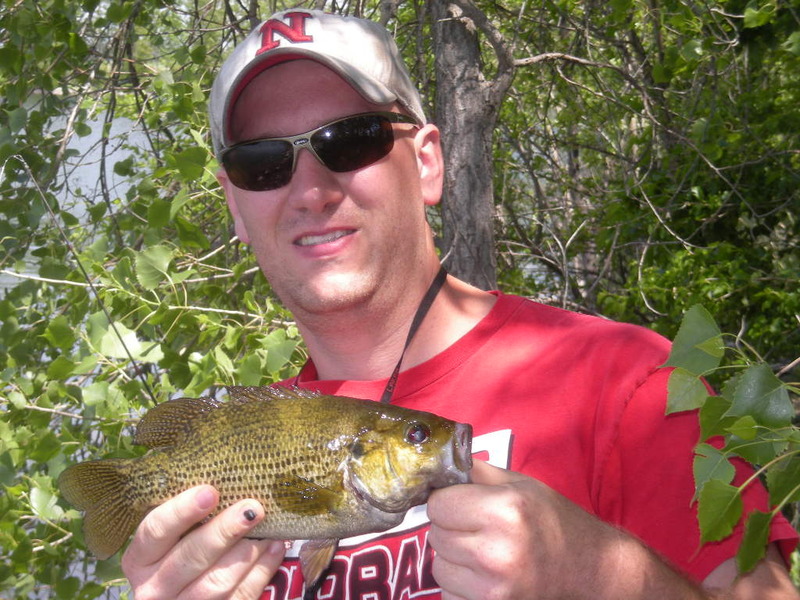 Daniel shows off an 11-inch rock bass. One of my nephew's with his 11-inch rocky. Now I have to brag on the boys a little bit. We all love fishing together and we all love seeing each other catch fish, but at some point it is nice to have some bragging rights. We will cover some water when we are fishing together because we all scatter trying to find the nicest fish! Well “the boys” wandered along and spotted a big rock bass. My daughter is the youngest of the family; younger than her brother and younger than all of her North Platte cousins, and she enjoys that position. Her big brother and cousin spotted a big rock bass and then came back to get her and let her catch it. 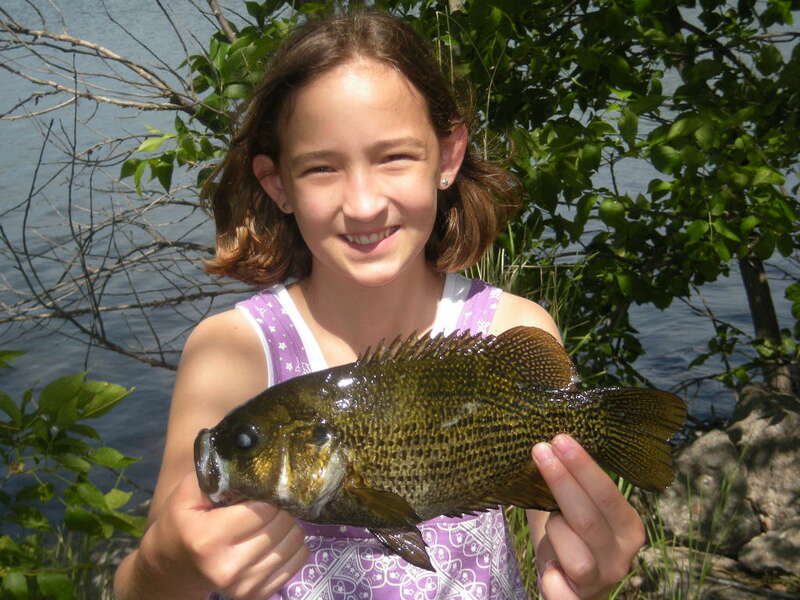 Emily with her 12-inch rock bass; biggest of the day. Way to go guys! You did good. I should have begged for some of their charity; the biggest I could manage was only 10 3/4 inches. Going to have to work with Emily on her photo taking skills--she cut my head off! Now let me crawl up on my catch & release soap box again here for a little bit. In a couple of hours of fishing on this one interstate lake, my son, my daughter, two nephews and I were able to catch over a dozen 10-inch+ rock bass. These fish were easy to catch once you figured out where they were and what it took to catch them. I believe at this time of year, we were probably catching a large percentage of the biggest rock bass in this particular interstate lake. 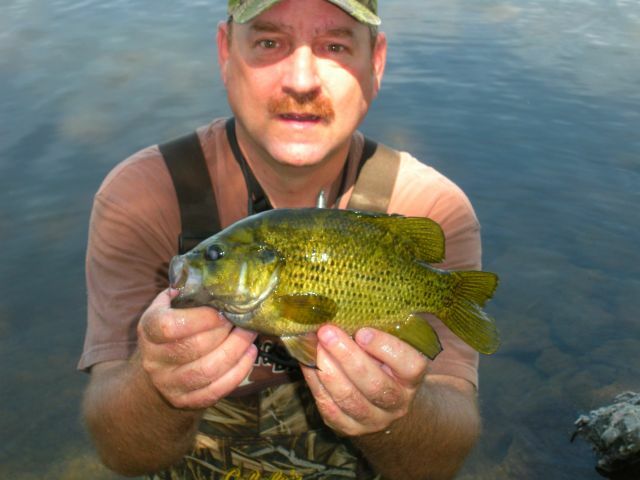 If we had decided to harvest those fish, and legally we could have taken every one of them, how many more big rock bass would there be to catch next year? We did not harvest one fish over the weekend, caught a bunch of panfish that would have made a good meal, and it would not have hurt anything to selectively harvest a few of those medium-size panfish. 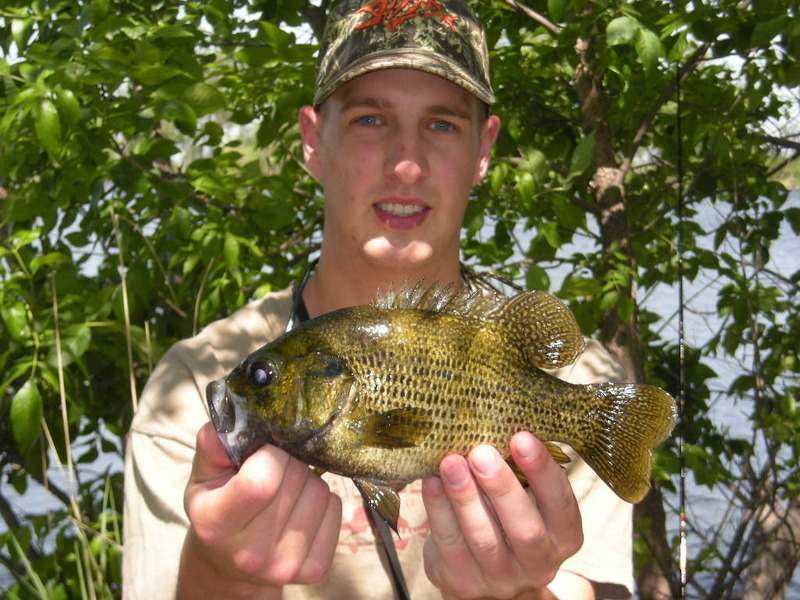 But I know how rare large panfish are, especially in public waters, and I would not even think of harvesting those big rock bass or big redears. 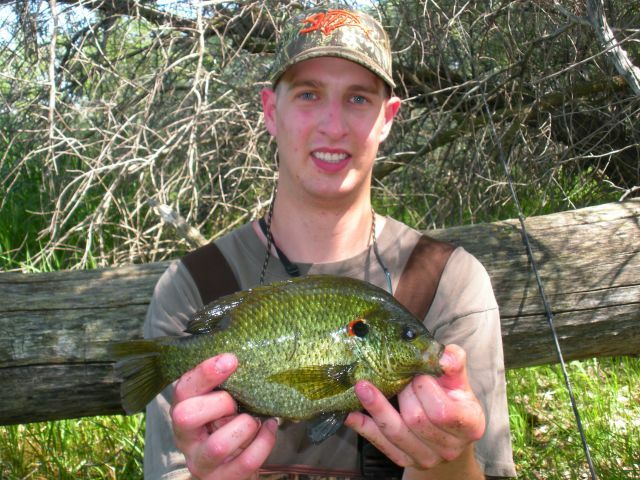 We have been catching some of these big panfish from the same interstate lakes for years, and after releasing those fish, I am betting we will continue catching them for a lot more years. We did not fish yesterday. One of my in-laws raises a few chickens every spring and Memorial Day weekend is the weekend where we all get together and butcher chickens. So that is what we did yesterday, and yes, I did eat chicken for lunch today! 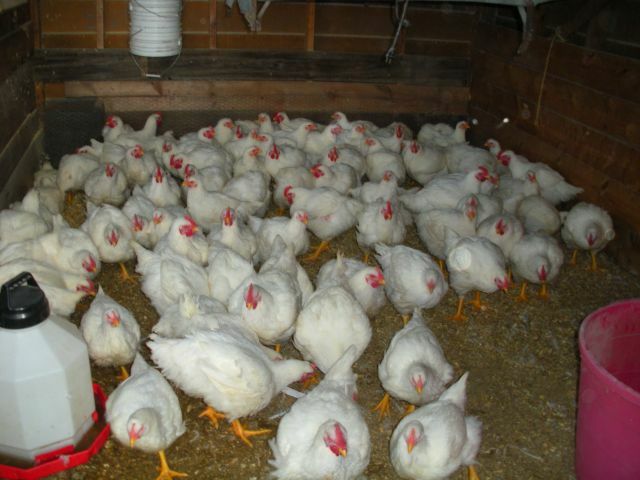 Here's the flock just before departing on their "winter retreat". Yep, I whacked the head off of every last one of them. Great update Daryl. Nice panfish and delicious looking chickens! I see the predator/prey relationship extends past the lake to the farm yard. Oh yeah! I am a carnivore. Love those redears. Caught my first one about 4 years ago at Wagontrain. My son and I have caght a few at Wildwood last couple years, and they have all come out of the same little cove within 20 feet of each other. Sounds like you know the spot. Do you have GPS coordinates? Ha.